The New York Rangers couldn’t have responded better to line changes which spurred them to a 4-0 stomping of the Atlanta Thrashers Tuesday night. Before the game Head Coach Tom Renney did some major line-shuffling. 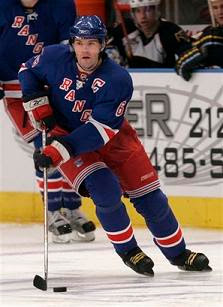 He moved Sean Avery to the top line with Jaromir Jagr and Scott Gomez, Brendan Shanahan is now skating on the right-wing with Nigel Dawes on the left side and is centered by Brandon Dubinsky. The third line is now comprised of Chris Drury centering for wingers Martin Straka and Petr Prucha, only the Betts-Orr-Hollweg line was unchanged. The tweaking seems to have paid off if at least for one night. The Rangers as a team skated with energy throughout the entire game and Jagr’s line combined for six points, two goals and four assists. The last time the Rangers moved around the lineup like this they initially responded well before they feel back into mediocrity and this time they realize they have to keep the pedal to the floor. "I am glad we won, but we have a long way to go," Jagr said. "We have to win a lot more games to get in the playoffs." The shakeup took place just one day after Renney said he would rather keep this current team in tact going into the playoffs instead of trying to improve the team by way of a trade. The Rangers have been linked to trade rumors involving the Columbus Blue Jackets lately, but it does appear that they are reluctant to make a move. What would have a bigger effect for the Rangers other than a trade would be for Jagr and Henrik Lundqvist to step up and be the leaders the team needs them to be. Lately Jagr has been contributing consistently scoring 24 points over his last 18 games and now it is time for Lundqvist to get on the same page. Not counting last night’s shutout over the Thrashers, he has given up three goals or more in 13 of his last 19 games and the team has gone 6-9-4 over that span. Renney may prefer to change lineups instead of changing rosters, but it may take a roster change at the blue line to get Lundqvist back to his early season form.